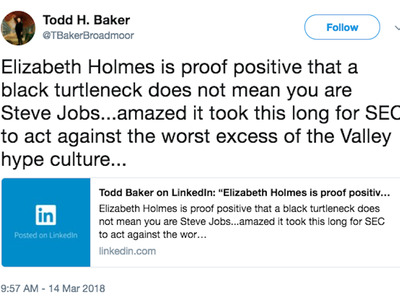 Many, including the New York Times, have argued that Holmes’ turtleneck has become a symbol of the backlash against her. Steve Jobs turned the black turtleneck into a symbol of creativity and success. Now, TheranosCEO Elizabeth Holmes is threatening to destroy everything it stood for. Holmes and Theranos’ former president, Sunny Balwani, were charged with “massive fraud” this month when the SEC alleged that the company “made numerous false and misleading statements in investor presentations, product demonstrations, and media articles” about its blood-testing technology while raising more than $US700 million. But, when the technology’s shortcomings were revealed by reporting in Business Insider and the Wall Street Journal, Holmes become a villain overnight, and her iconic black turtleneck a symbol of mistrust. “Such an individual uniform has a risk if you don’t live up to the promise. In the end, it’s the substance behind the style that makes the difference; what you wear becomes its expression,” New York Times fashion critic Vanessa Friedman wrote on Friday. Holmes was once referred to as the youngest self-made female billionaire, with an estimated $US4.5 billion fortune to her name. In 2016, Forbes lowered their estimates of her net worth to zero. In an interview with Glamour in 2015, Holmes said her mother had put her in black turtlenecks since she was eight years old. Later in life, this became a uniform – something she could wear every day without having to think about it. “All my focus is on the work. I take it so seriously; I’m sure that translates into how I dress,” she told Glamour. “[Holmes] has never tamped down the predictable comparisons that people made to Steve Jobs. If a central ingredient of a credible narrative is authenticity, and I think it is, trying to dress like someone else (Steve Jobs, Warren Buffett or the Dalai Lama) undercuts that quality,” NYU professor Aswath Damodaran wrote on his blog at the time. 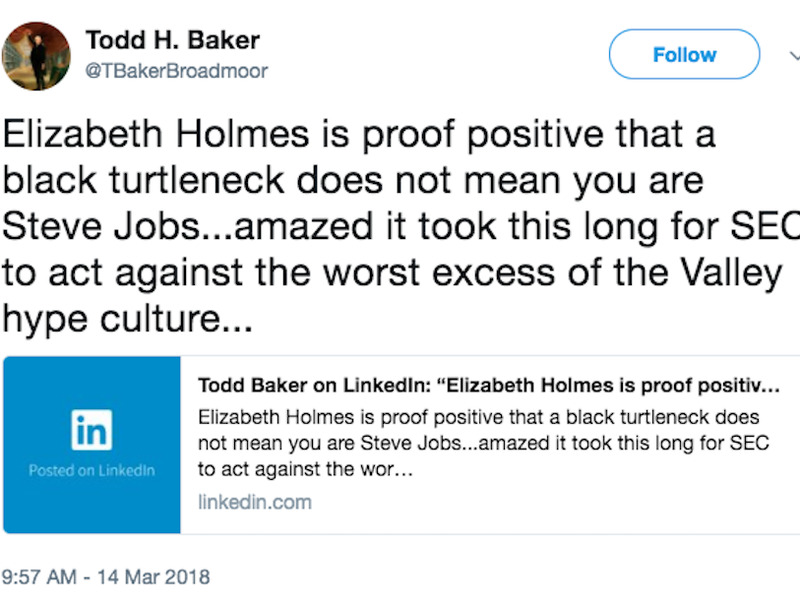 “In the same way that Gordon Gekko’s suspenders and Michael Milken’s toupee became symbols of their greed, Ms. Holmes’s black turtleneck is starting to seem less a brilliant frame than a false front; a carefully calculated costume that fooled everyone into assuming she was more brilliant than she was; a symbol of hubris rather than success,” Friedman wrote. Holmes agreed to give up financial and voting control of the company to resolve the SEC’s charges against her and Theranos. 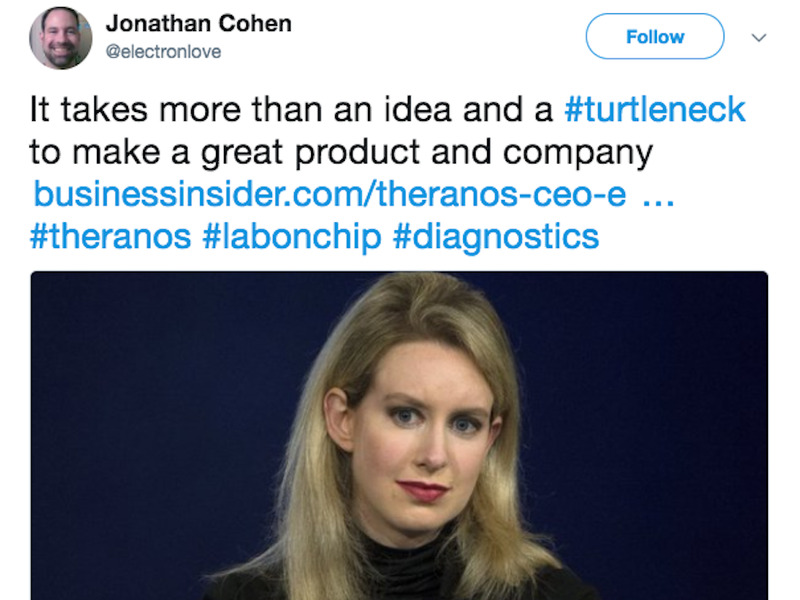 She must also pay a $US500,000 fine and return 18.9 million shares of Theranos stock.